AMG is a name famed for producing some of Mercedes' most fearsome machines and the company is keen to cash in on its sub-brand's cachet, by producing more affordable but still rapid AMG Sport models. The latest to arrive, is the C450 AMG Sport. Unlike the indecently rapid upcoming C63 AMG versions that tear to 62mph in as little as 4.0 seconds, the new models boast permanent four-wheel drive, though two thirds of the power is sent to the rear wheels. 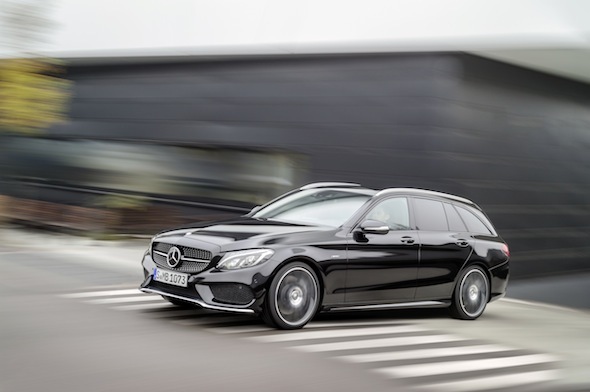 It may sit a rung below the full-blown AMG models but the C450 can still sprint to 62mph in a scant 4.9 seconds – 5.0 seconds in estate form – courtesy of a 3.0-litre twin-turbocharged V6 engine. This powerhouse pumps out 362bhp – enough to test the C63 AMG-derived suspension, though claimed fuel economy stands at a reasonable 37.1mpg for the saloon and 36.6mpg for the estate. Emissions of 178g and 180g/km respectively mean annual car tax will set back drivers £225 per year under the current tax bands. Despite the relatively frugal motor under the bonnet, the C450 AMG Sport has been tuned for keen drivers with a sports exhaust set up for a throaty exhaust note and a fast-shifting seven-speed automatic gearbox with steering-wheel mounted paddles for manual control. The C450 also has adjustable driving modes that sharpen up the driving experience, along with adjustable suspension. Both C450 AMG Sport models will arrive in the UK in summer 2016. Pricing and specifications are yet to be confirmed but the saloon is likely to weigh in at around £38,000 to £40,000 to compete with rivals such as the Audi S4 and BMW 335i.